Opioids is a drug class that comprises of the illicit drug like heroin and the licit prescription pain relievers like oxycodone, hydrocodone, codeine, morphine, fentanyl and others where they chemically relate and interact with opioid receptors on nerve cells in the brain and nervous system to produce pleasurable effects and relieve pain. In 2015, 20.5 million Americans (12 years or older) were suffering from substance abuse disorder and 591,000 had a substance use disorder involving heroin. Opioids are drugs formulated to replicate the pain reducing properties of opium. During 2015, there were 52,404 overdose deaths in the United States, including 33,091 (63.1%) that involved an opioid i.e. an average of 91 opioid overdose deaths each day. The US consumes 80% of the world’s legal and illegal opioids; they are the country’s most abused prescription drug, in addition, the use of weak opioids is declining, while the use of strong, more easily abused opioids is inclining. Goldstein Research analyst forecast the opioids market size is set to reach USD 15.24 billion by 2024, at a CAGR of 5.5% over the forecast years. The FDA has augmented perturb over the high use, and the potential for misuse, of opioids which could lead to the enforcement of regulatory checks that affect the opioid treatment market and its potential growth. The report covers the present ground scenario and the future growth prospects of the Opioids market for 2016-2024 along with the data of production of opioids worldwide. We calculated the market size and revenue share on the basis of revenue generated from major players across the globe. The Opioids market is forecasted on the basis of revenue analysis, product benchmarking and strategic developments of key market players. The market is forecasted on the basis of number of ongoing clinical trials and investments in opioids. Based on application, pain management dominated the market with the market share of 30% in 2016 owing to the pain reliever in most the chronic ailments, for instance, Toradol, is the most powerful NSAID (like Advil or Aleve) and is as effective as morphine for post-surgical pain, and is advertised as opiate strength pain relief prescribed by Stanford which is against opioids for chronic pain. Cancer pain segment is growing fastest at the rate of 6.1% over the forecast period owing to the increasing incidences of cancer where 30% to 50% of cancer patients experience moderate to severe pain and opioid (morphine-like) drugs are used commonly to treat moderate or severe cancer pain, and are recommended for this purpose in the World Health Organization (WHO) pain treatment ladder. Opioids Market Outlook 2016-2024, has been prepared based on an in-depth market analysis from industry experts. 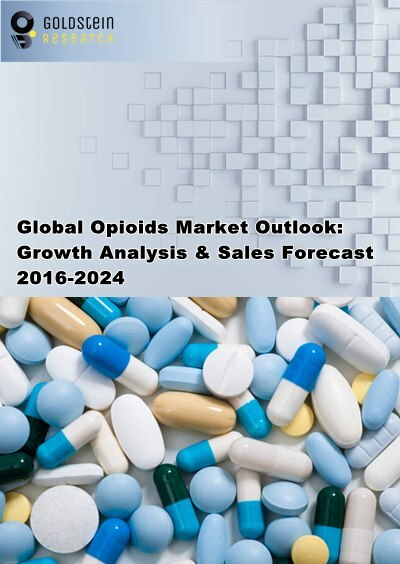 The report covers the competitive landscape and current position of major players in the global Opioids Market. The report also includes porter’s five force model, SWOT analysis, company profiling, business strategies of market players and their business models. Global Opioids market report also recognizes value chain analysis to understand the cost differentiation to provide competitive advantage to the existing and new entry players. Our global Opioids Market report comprises of the following companies as the key players: Purdue Pharma L.P., Allergan Plc (Actavis), Pfizer, Inc., Janssen Pharmaceuticals, Inc., and Egalet Corporation. According to the report, major driving factor is the increasing demand for narcotics-based pain management solutions owing to rising trauma cases, surgical procedures and road accidents. Rising number of palliative care centers and home healthcare services are also spurring the demand of opioids in the market. Further, the report states the biggest challenge is the multiple lawsuits against opioids usage, for instance, Delaware became the latest state to file a lawsuit accusing corporations of helping fuel the national opioid epidemic, suing a wide range of companies involved in making, distributing and selling prescription painkillers. Based on geography, North American market for opioids is expected to grow at a CAGR of 7% which is expected to reach at USD 17 billion from USD 11 billion in 2016 by the end of the forecasted period owing to application of opioids in surgical post treatments and cancer pain management. The market shows steady growth in Middle East and Africa whereas Asia Pacific is expected to be the fastest growing market for opioids market attributed to increasing investments in R&D by the major players, improvement in healthcare infrastructure, increasing opioids based pipeline products specific to chronic pain treatments and increasing patient base. What is the revenue of Opioids in 2015-16 and what would be the expected demand over the forecast period?